After debating on what to cook the Italian Parsley in, I went with most decadent and classic option… Carbonara. Easy right? Eggs, noodles, guanciale (or a similar substitute such as pancetta or bacon) and cheese topped with some parsley. 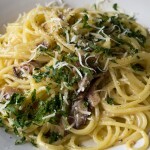 Carbonara is one of those things that rely on quality ingredients. First things first. The meat. Most traditional recipes call for something called guanciale, which is a cured meat taken from pork jowls or cheeks (yikes). This ingredient can be a bit tricky to find and if you can’t seem to get your hands on some, you can also use pancetta or a quality cut of bacon. I wasn’t able to get ahold of any guanciale or pancetta so I used bacon in my dish below. Luckily, we have our own chickens so the eggs were taken care of. Going with a nice pastured egg will give you a nice creamy and rich sauce. 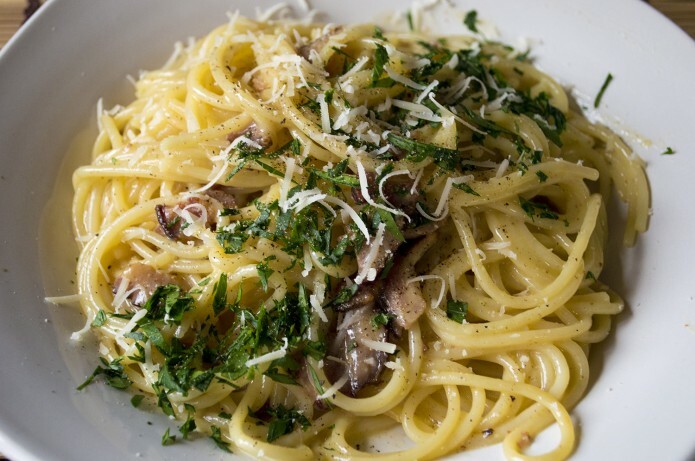 As for the cheese, find a quality Parmigiano-Reggiano and IF you can get your hands on any Pecorino (A hard Italian cheese made from sheep’s milk) it will make your carbonara taste like a million bucks. I also stick with a dry spaghetti noodle. Now onto the topic of technique. If done wrong, you can wind up with scrambled eggs and noodles which isn’t exactly a good thing. I do suggest getting your eggs to room temperature before adding them to you dish. I always crack mine into a bowl and let them while I prepare everything else. When you’re at the stage of adding your egg mixture, always always always add to a pan that has been removed from the heat. Otherwise you’ll be eating scrambled eggs for dinner. Now, onto the recipe. Bring a large pot of salted water bring to a boil. In a mixing bowl, whisk together the eggs, Pecorino and Parmesan. Set Aside. While the pasta is cooking, heat a large skillet over medium heat. Add your bacon (or guanciale or pancetta) and cook until the fat has rendered and the meat is crispy. Add half of the reserved pasta water to the pan. Toss in the spaghetti and agitate the pan over the heat for about one minute. REMOVE the pan from the heat and add the egg and cheese mixture. Stir quickly until your eggs thicken. The residual heat will cook the eggs. Continue to stir quickly to keep your eggs from scrambling. If your sauce seems a little too thick, add some more of the reserved pasta water. Toss with minced parsley and season with fresh ground black pepper. Add salt if needed (the cured meat should be salty enough on it's own to season the dish). 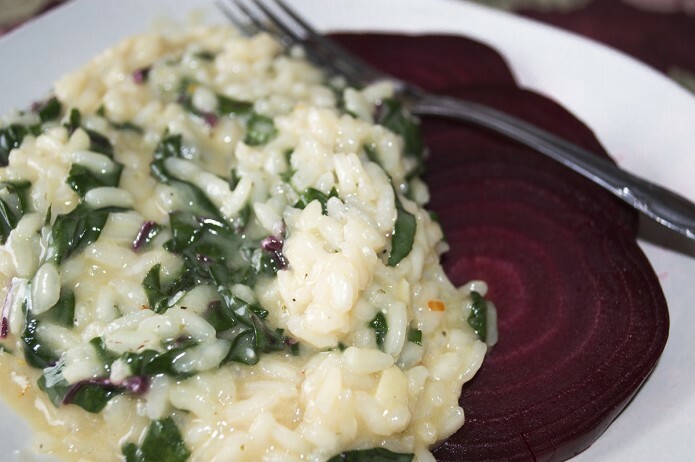 Serve and top with a little grated Pecorino. Enjoy! The soup is reminiscent of a soup that shall remain nameless from Olive Garden but with a few more ingredients and some home cooked lovin’. The zucchini from this week’s box made a nice final addition to the recipe! Enjoy! In a large stockpot, brown your sausage and onions over medium heat. Once your sausage is brown and your onions have cooked, add the garlic and cook for about 2 minutes. Deglaze the pan with the white wine and scape up any little bits that are stuck to the pan. Add chicken broth, the minced and roasted red bell pepper, potatoes, thyme, red pepper flakes and pepper. Cover and reduce heat to low. Cook for about 10 minutes or until your potatoes are FIRM but cooked. 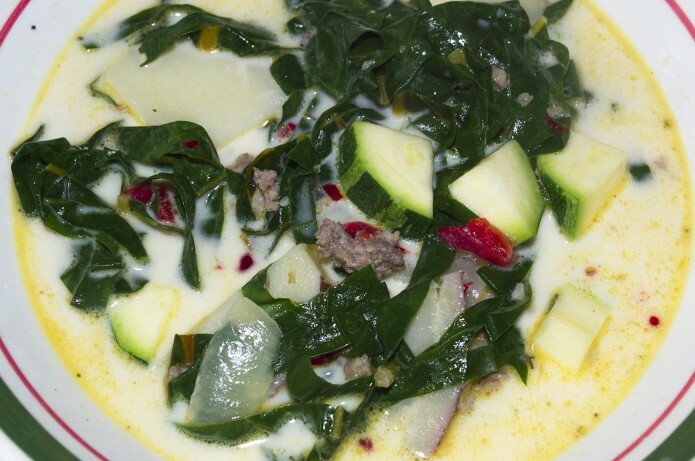 Once your potatoes are firm (but cooked) add your heavy cream, swiss chard and zucchini. Now, cook the soup for another minute or two. 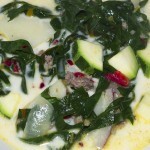 I prefer my zucchini pretty firm so I like to add them at the very end with the chard and cream. If you like them softer, add them a little sooner! Add salt to taste (if needed). I generally do not need salt, it all depends on the broth you used in the soup! 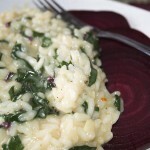 Serve with grated parmesan on top. Enjoy!